As the second day dawned the 9th SS Panzer Division continued to reinforce the German blocking line. Krafft's unit withdrew overnight and joined Spindler's line, coming under his command. Spindler's force was now becoming so large as more men and units arrived at the new front, that he was forced to split it into two subdivisions - Kampfgruppes Allworden and Harder. 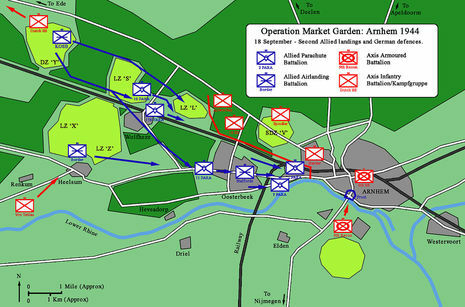 The defensive line now blocked the entire western side of Arnhem and had closed the gap exploited by Frost alongside the river the previous evening. 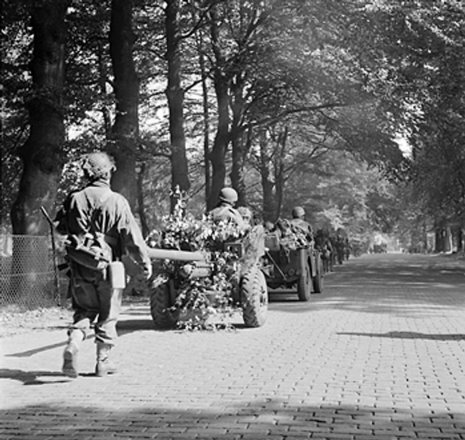 Overnight the British 1st and 3rd Parachute Battalions had skirted as far south as 2nd Parachute Battalion's original route into the city, hoping to follow them into Arnhem centre. They approached the German line before light and for several hours attempted to fight through the German positions. Spindlers force, being continually reinforced, was too strong to penetrate and by 10am the British advance was stopped. A more co–ordinated attack followed in the afternoon, but it too was repulsed. Urquhart attempted to return to his Divisional Headquarters at Oosterbeek but became cut off and was forced to take shelter in a Dutch family's loft with two fellow officers. Lathbury was injured and also forced into hiding. At the road bridge, German forces of the 9th SS Division had quickly surrounded Frosts battalion, cutting them off from the rest of the division. At around 9am, the 9th SS Panzer Reconnaissance Battalion headed back toward Arnhem from south of the river, having concluded that it was not needed at Nijmegen. Though aware of the British troops at the bridge, it attempted to cross by force. In the resultant two hour battle it was beaten back with heavy losses, including its commanding officer Viktor Gräbner. German attacks carried on around the British perimeter for the rest of the day but the British continued to hold.